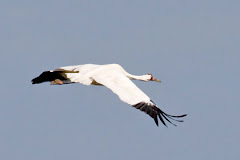 Taking Flight: International Migratory Bird Day! Saturday was the first annual International Migratory Bird Day celebration put on by REGI. If you don't know about International Migratory Bird Day (IMBD), it is the signature celebration of Environment for the Americas. It is celebrated in the United States and Canada on the 2nd Saturday of May annually, as birds are on their return from the southern latitudes, and is celebrated in Mexico, Central America and South America in October, as the birds head back south. 1000's of organizations hold events in celebration of IMBD. (You can find out more about the celebrations here.) In past years REGI has traveled and given programs at other IMBD celebrations, but this year we wanted to hold our own! We started off the day with a bird hike along the board walk on Antigo's City Trail. It is a beautiful place to look for birds with the board walk through the marsh and forest along the edge. The habitat is spectacular. We had great luck seeing many birds including: Sora Rails, Yellow Warblers, Common Yellow-throats, Red-winged Blackbirds, and a Broad-winged Hawk soaring above, along with many other birds. In the afternoon we held a Celebrate Birds! event in the Antigo City Park. The weather seemed to be working against us, and became colder and rainier as the day progressed but we had a wonderful group of volunteers who stuck it out and we still had a crowd of dedicated attendees who joined us for activities and a raptor program. Attendees made pine cone bird feeders to attract birds to their own backyards. These simple bird feeders are simply made by spreading peanut butter onto the cones and then rolling them in bird seed. It is a great way for kids to create something special that will help them attract birds to their backyards. Children were "caught" in a "mist net" (badminton net) and "banded" to teach them about bird banding. Data was collected on their species, wingspan and weight, in a similar fashion to if they were real birds being mist netted and banded. It was a fun way to learn about how real scientists are banding birds. A station was set up to teach about how to use binoculars and spotting scopes. They also learned about some of the urban birds that can be found in cities and backyards. Karissa designed a bird beak matching game to teach children about how birds beaks are perfectly adapted to the kind of food that they eat. We capped off the day with a live raptor program. This tends to be most peoples favorite and this is what brought the biggest group of people. We introduced the crowd to 5 of our very special educational raptors. It was a great day! We hope that next year we will have better weather and will see more of you there. We have a migratory visitor in the clinic with us right now. IMBD is so perfectly timed, we have been seeing many migratory species at the feeders and in the woods, but Friday one showed up after flying into someones window. This little White Crowned Sparrow (Zonotrichia leucophrys) is staying in the clinic while his wing heals. He seems to be on his way to health and we hope that he won't be staying much longer, so he can continue on his way to the far north. This range map, from the Cornell Lab of Ornithology, shows the summer breeding range of the White Crowned Sparrow. He will have a long journey ahead of him once he leaves here. While I was talking to people at the IMBD celebration I learned that these little birds have been spending a lot of time at feeders in town. There were some baffled bird watchers who are not accustomed to seeing this visitor and did not know what they were. So, keep your eyes open for uncommon visitors as you are out and about in the following days. You never know what you may find!